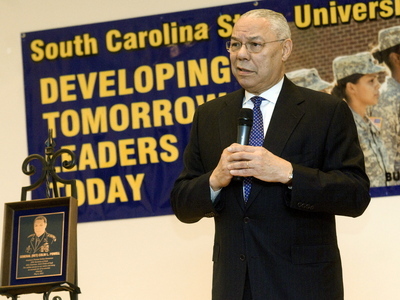 Former Secretary of State and Joint Chiefs Chairman Colin Powell speaks during a ceremony inducting him as an honorary member of South Carolina State University's Army ROTC Hall of Fame Friday, May 6, 2011, on the school's campus in Orangeburg, S.C. According to the AP, the stadium roared in approval of Powell’s comments on the president’s move earlier this month to quell the doubts of those who don’t believe he was born in Hawaii. The retired Army four-star general endorsed Obama’s 2008 presidential bid. Earlier Friday, Powell was made an honorary member of the school’s ROTC hall of fame. No he crushed them is what he did!